The Ralston Cider Mill, located in Mendham, NJ has been brought back to life by a dedicated group of local preservationists after more than 70 years of inactivity and neglect. 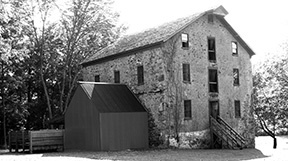 The three story stone building was originally build in 1848 as a gristmill powered by a large wooden overshot waterwheel. 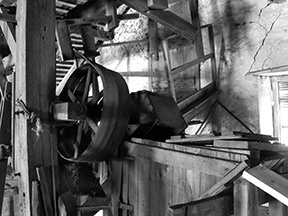 In 1909 the grist milling machinery was removed and two massive Boomer & Boshert cider presses were installed along with ancillary machinery. Operating as a cider mill and distillery under several owners the mill finally closed its doors in 1938. For the next several decades the building sat idle with weather taking its toll. Large sections of the roof failed, floors collapsed and the heavy machinery started to succumb to gravity. 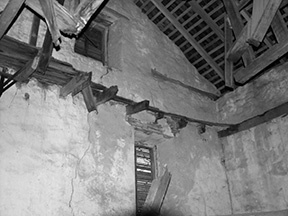 The roof was repaired several years ago but nothing was done to the structure or machinery inside the mill. From the photos you can see the extent of the deterioration inside the mill that had taken place once the building was abandoned. 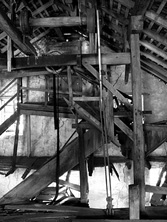 After the roof failed the floor structures were greatly weakened by exposure to the elements. When we started work the building was very unstable and quite dangerous. Our first priority was to create a safe working environment. Staging was designed and built to stabilize what was left of the floor frame as well as providing a safe work platform. We endeavored to save as much of the original material as was possible, this is the primary historic fabric. 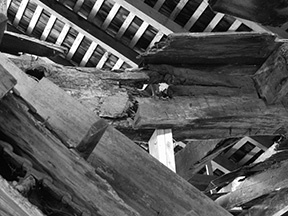 Large areas of the structure were deteriorated beyond repair; in some cases complete replacement was necessary. Before any demolition took place the deteriorated areas were carefully inspected and documented. Along with obvious construction details, isolated wear marks and stains very often prove to be vital clues for reconstructing the structure of the building and the layout of machinery. 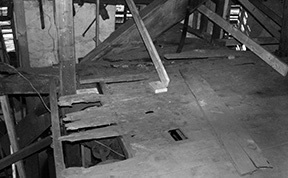 Historic layout systems incorporate specific marking systems at the timber joints, a close look at tooling marks such as hewing details can provide information about the age of the building as well as a glimpse into the original builders tool box. In the case of this mill there were several layers of use and adaptation that became evident as we grew more familiar with the building. With this information in hand we set about the restoration process. Since the new roof was already in place before we were called upon to complete the restoration, the next phase of the project was to repair and replace the components of the floor level frames and flooring. This work included threading new sections of the massive white oak floor support timbers up into the building to splice onto existing pieces as well as installing new support posts, new joists and flooring. Again the research and documentation was valuable for re-establishing machinery support structure placement and configuration. This phase also included rigging and hoisting some of the collapsed machinery and apple handling hoppers back up into place. 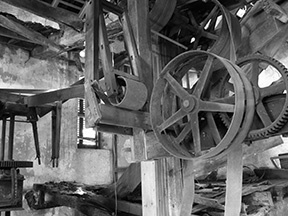 Once the floor levels had been rebuilt the next task was to restore the milling equipment back into working order. This included the apple conveyor, a large wooden hopper, the grater, a track & cart system and the presses themselves as well as piping and storage vats. 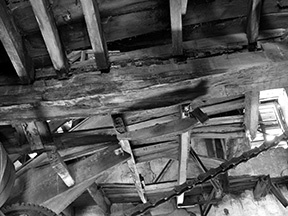 The conveyor had been directly beneath a section of the deteriorated roof so required casting several new bearings and an almost complete rebuilding of the wooden cases. New knives were fabricated for the grater and its bearings were cleaned and realigned. The cart and track system that is used for shuttling the mash to the presses had to be re-established across rebuilt areas of the floor and brought to working order. 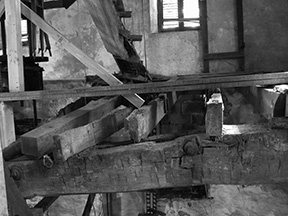 Many sections of the lineshafting that distributed the waterpower throughout the mill needed bearings remounted and aligned, shafting replaced, pulleys repaired and belts installed. The 2-5’ square presses had not been operated in over 80 years and so needed a complete cleaning and overhaul. Historically some of the machinery had been quickly set up or repaired in a somewhat crude manner. It is always tempting to want to improve the less-than-perfect workmanship that is sometimes found in historic structures, however this work is all a part of the sites history and often provides an educational opportunity for interpreting the daily operations of the mill. While the mills machinery had first been powered by a large wooden water wheel (in its gristmill phase) and later a cast iron turbine the water source for the mill was no longer available so we designed and installed a concealed electric power system. This incorporated a variable speed feature and is operated by the turbine control handwheel. 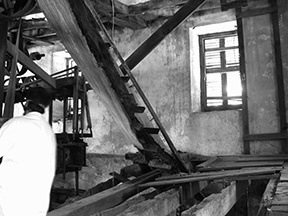 Although this was a mill project involving both machinery repairs and structural work to the building the same processes apply to almost any repair or restoration project. Each job has its own set of requirements, be they budget, end use considerations or the sites history but the basic tenets of observation, careful workmanship and respect for the original craftsmen are always appropriate.